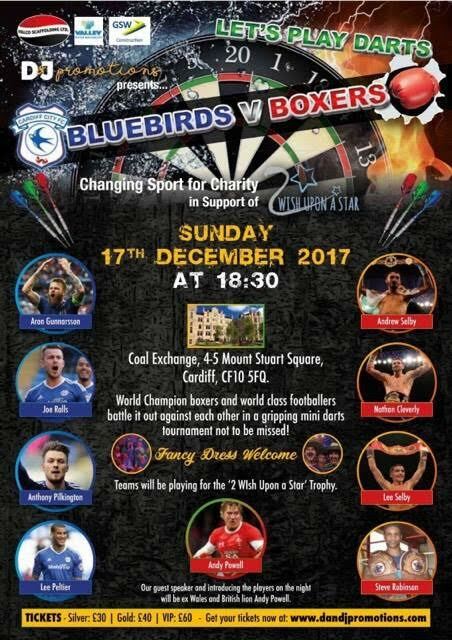 Trainer Darren Wilson has announced that his company, D and J Promotions will be at the forefront of a spectacular night of darts entitled ‘Bluebirds Vs Boxers’. The event itself will see Cardiff City FC’s players square off against a who’s who of Welsh Boxing on the Oche. The event which will take place on December 17 at the Coal Exchange in Cardiff will also be a night where money will be raised for the 2 Wish upon a Star charity. Wilson opened up on how the event came about and previewed what people can expect on the night. The event will see Cardiff City FC’s Aron Gunnarsson, Lee Peltier, Anthony Pilkington and Joe Ralls take on Nathan Cleverly, Lee and Andrew Selby and Welsh boxing great Steve Robinson with Welsh Rugby Union great Andy Powell as the special guest MC. Wilson elaborated on what he foresees on the night of December 17. He said, “It’s going to be a great atmosphere, just like the darts you see on Sky Sports. It’s going to be a great night for a great cause. “I got involved with the 2 Wish Upon a Star charity as what they do has affected people close to me. They are a fantastic charity and help a lot of people in the local community so I am delighted that we are able to help them out on the night.